Recently, I have a few weeks to work with the Optron Pro video magnification system when it was loaned to me by the manufacture's rep, and I was able to put it through it's paces. I would categorize this product as a true video magnification workstation. I have to admit when I first saw this company's product 2 or 3 years ago, I wasn't too impressed. Since I first saw it, several improvements have been made that I think have really improved the usefulness of this product. 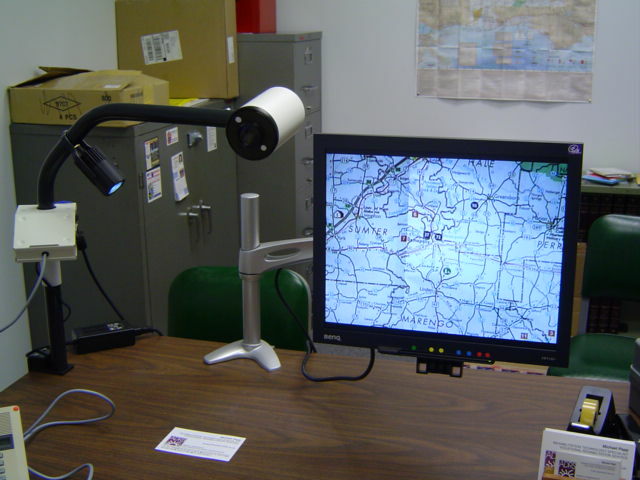 The video magnifier consists of a camera (about the size of a frozen orange juice can) mounted on a steel arm. There is also an LED reading lamp attached to the arm. The arm is clamped to a desk or table, or it could be bolted to a table if someone were so inclined. Most of the controls (zoom, brightness control, auto-focus freeze, line tool, inverse color, and computer switch) are located on a control pad (which is about twice the side of a computer mouse) that is attached to the camera unit with a 50" cable. There are still some controls attached to the base of the camera arm, including the on off switch for the camera, the on/off switch for the lamp, and the color mode changer switch. The rep assures me the engineers are working on moving the rest of the controls to the control pad. 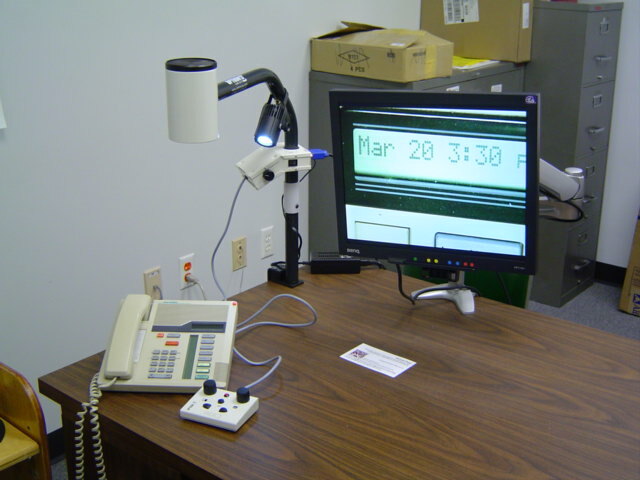 A CRT or LCD monitor can then be plugged into the base of the arm, and this unit has an SVGA input so that the user can switch between video magnification and computer screen views. There is no split screen mode. The device has always had excellent optics, but I found the digital magnification to be not so good on the old version. This current version has much better digital magnification, and the optical magnification is top rate. When shown on a high quality LCD screen, it is crisp and clear, with less ghosting than I have seen on other products. Several of the folks with low vision whom have seen this product tell me they really like the image quality. What makes this device unique is the large area a user can magnify. The arm can be mounted to provide 10 inches of clearance between the work surface and the camera, and arm can rotate fully around a 20" radius. The camera uses "Twist Cam" technology, allowing the user to easily rotate the camera to keep the image on the display upright as they rotate the arm or the camera to view different objects. 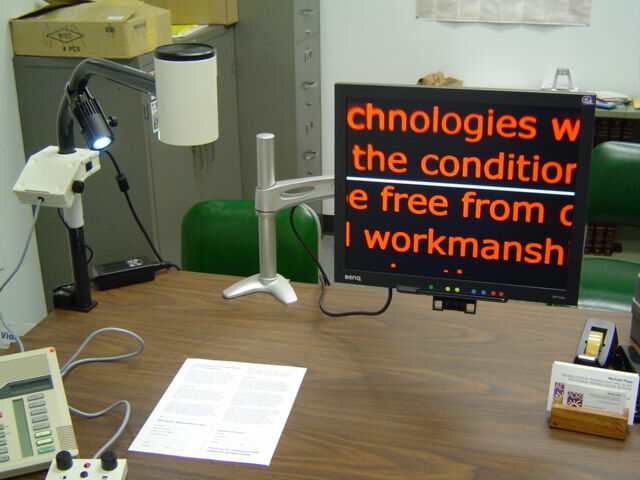 The pictures I have include here demonstrate how the camera can be mounted to view a wide variety of thing in the office environment, including the hard to read black and white LCD display on a common office phone. The system is not portable, but it is easily transportable, especially if you already have a good monitor in several locations. The camera unit can be carried between different offices or taken home, and comes with a padded carrying case. The Optron video magnifiers are in the same price range as other high end video magnifiers, but offer very high quality images with versatility in a wide variety of applications. Additionally, there are some more recent additions to their product line; Less expensive units with more limited controls for people who do not require all the options. Visit http://www.optronusa.com/ for more details. 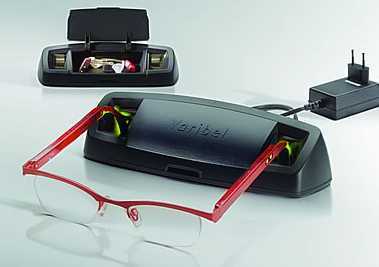 Varible, a Dutch company, is now marketing a pair of glasses with an integrated hearing aid. The eye glass frames contain the microphone and electronics to process the sound, and deliver the sound through an ear bud that hangs down near the ear piece. The glasses were developed at Delft University of Technology, and Varible commercialized the product. They are for sale in the Netherlands as of April 2006. The idea behind the eye glass hearing aid was to develop a better way to directionalize sound. Often times a person using an assistive listening device can not hear what they want to hear over background noise, because everything is amplifed by their hearing aid. Some models of digital hearing aids will filter sounds, but this still isn't perfect. The hearing glasses attempt to solve this problem by amplifying sound from the direction the user is looking in. The hearing glasses still pick up peripheral noise for the user, but the amplification is more directional.